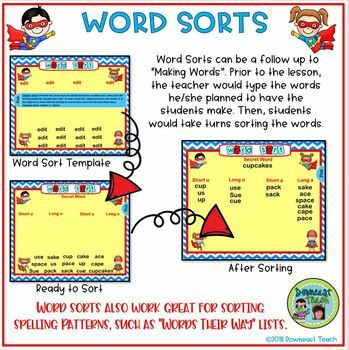 Create customized word work and spelling practice activities for your students that are perfect for literacy center rotations! 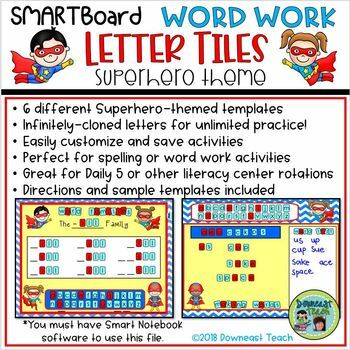 This colorful superhero-themed file has been updated and now includes 6 different Word Work activities that you can edit and customize for your students. •	Word Families: Use the infinitely-cloned letters to create word work for a specific word family. •	Word Work: Use for practice with sight words, high-frequency words, and other word work that is not word families. 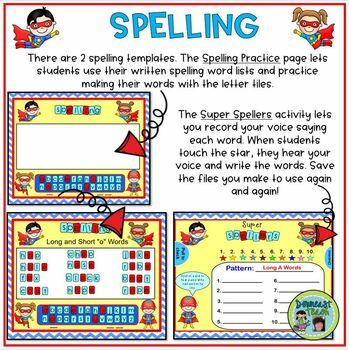 •	Spelling Practice: Students practice spelling their words with the letter tiles using a copy of their spelling. There is a sample of each type of activity along with detailed directions for customizing the templates and how to save templates in the gallery. This file is perfect for literacy center activities for small groups, or Daily 5 Word Work rotations. Activities can also be done whole-class with students following along on paper, whiteboards, or with plastic letter tiles. *IMPORTANT: This is a Smart Notebook file. If you do not have this or compatible software, you will not be able to open the file. If you are unsure, before purchasing, please download the preview file to make sure that the infinitely cloned letters will work. Visit my store to see additional SMART Board resources. Follow me to hear about new products! • Look for the green star near my logo on any page within my store and click it to become a follower. You will then be notified when I post new products!